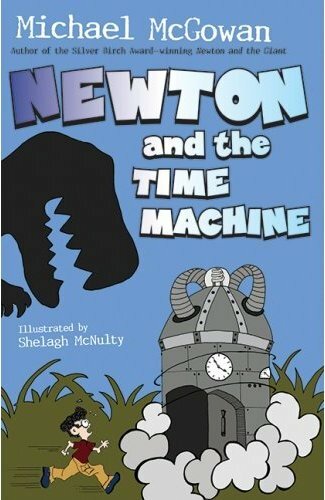 I was sent a copy of Newton and the Time Machine by Michael McGowan to review. This story is a sequel to Newton and the Giant and starts off where the other one left. Have no fear if you haven’t read the first book. You will not be lost. The characters in the first story are in this one too but Michael does a great job of reintroducing them so that you feel as though you haven’t missed anything by not reading the first book. Newton is a young, smart boy who is a mastermind at inventing. His latest quest is to build a time machine to go back in time and see dinosaurs as they once were. Nothing ever goes quite as planned for Newton and his invention leads him on another adventure to save his new friends and possibly the world. I need to start by saying, I love kids books. I can’t wait until Baby Bird is old enough to read and then maybe we can start our own book club. Okay, there’s the dorky Mama Bird in me coming out. Let’s just all pretend I didn’t say that! The imagination that Michael brings to this story and to each individual character is wonderful. His descriptions are detailed enough that I can get a good image in my mind, but not over detailed to the point that I am bored from too much information. I found myself looking forward to the end of the day when I could climb into bed to read about how Newton was going to solve his next problem with his smarts and the help of his friends. All of the characters bring their own qualities to the story and one of my favorite parts is when Newton’s friend Max saved the day with his ‘Special Card’.There are 210 pages and it is a good read for those 8 to 12 years old. This is a wonderful read and I look forward to any future books about Newton’s adventures from Michael McGowan. I've always loved your blog design!